ECIS TID Committee Blog | Team Drive is here! 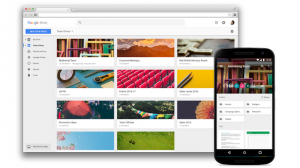 Team Drive is G Suite’s take on team file sharing — and it’s started taking beta testers. Here at ICS Addis Ababa I am happily trying out Google’s new Team Drive with our faculty. We have been on the “rapid release” track for all G Suite updates, but this one was actually an opt-in early invitation. To get early access I applied directly to Google and our faculty completed a brief survey about their current use of Drive. Google reviewed our application and approved us on Tuesday of this week. It is still early, but we are enjoying what we have seen so far. I will post more about Team Drives later this school year when we have settled into who uses them when and for what. How about your school? If you are a G Suite school, are you also experimenting with Team Drives? We have got it this week. It potentially is a great solution to organising department and subject files. However limitation at moment it that folders cannot be copied across to team drive, so moving existing resources would take a while!